Previous Post: Parables of Care is Here! Dr Simon Grennan, is a Post-Doctoral Research Fellow in Art and Design at the Department of Art and Design, University of Chester. He is an internationally acclaimed contemporary artist, comics scholar and author of over 40 comics and artists’ books. 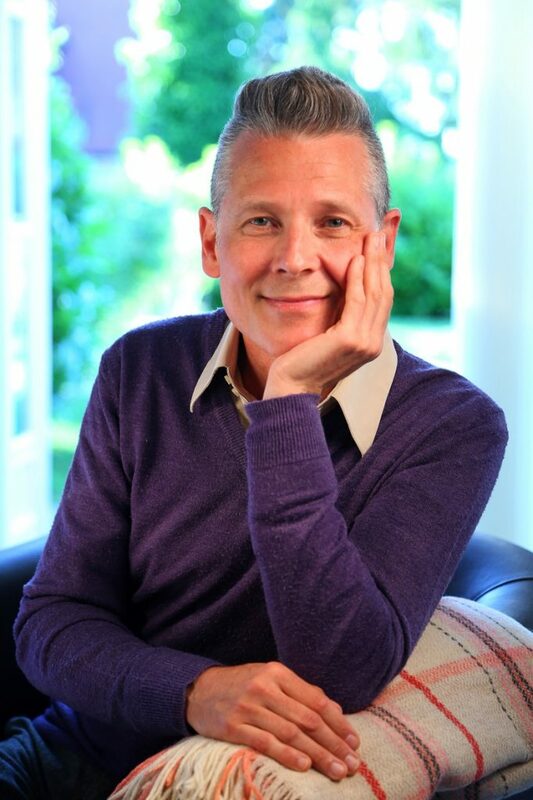 Simon worked in partnership with Dr Ernesto Priego of City, University of London, Dr Peter Wilkins of Douglas College, Vancouver, Canada and an NHS Trust, to produce Parables of Care. We asked Simon some questions about working on Parables of Care. What was your first impression of the Care’N’Share stories? Simon Grennan: I was immediately fascinated by the combination of descriptions of emotional/physical challenges and the extreme brevity of the case studies. The stories told by carers already conformed to a rather strict pattern derived from a proforma, designed to enable speedy access to the information that each story provides, for readers. This might have denuded the case studies of their affective aspects, but in fact, it focused and intensified them. That was immediately striking and interesting. What was the most challenging for you in the drawing process? SG: The editorial task for Peter, Ernesto and I involved considering how this combination of emotional impact, information and brevity could be visualised. 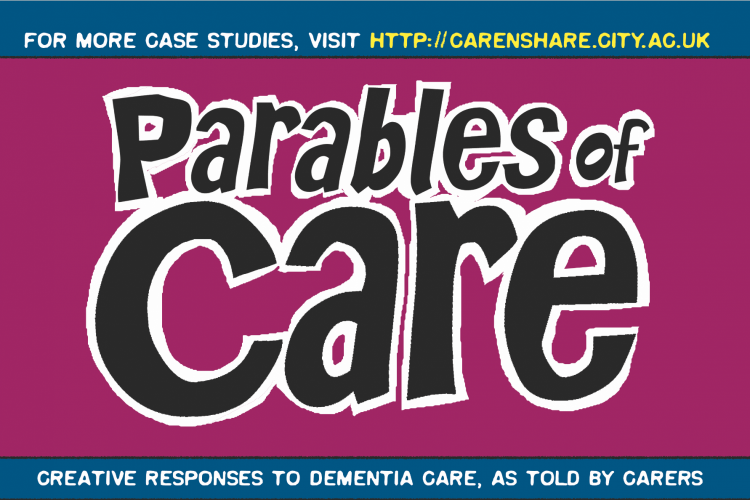 The concept of the parable offered an accurate description of the stories as told by carers: the original stories already had the effect of parables. We lighted upon a key aspect of the parable – its function of representing big effects (issues, truths, significant ideas) by small means. This ‘big in small’ characteristic was actually quite easy to visualise, because there is a great range of visual models, particularly in the history and traditions of the comic strip: visual gags, for example. We immediately thought of the four panel Japanese ‘yonkoma‘ joke strips, which follow a set pattern for divisions of action. The form both produces and disperses ambiguity. That’s the way in which it works as a visual joke. Although the Care’N’Share stories aren’t jokes, by any means, part of their ‘parable’ character articulates exactly this manipulation of clarity and ambiguity. This seemed like a form particularly suited to these particular stories about dementia care, in which initial challenges to capacity, comprehension and communications are overcome by creative means. In each story, there is a challenging scenario resulting from a specific experience of dementia, which is then reflected/acted up and finally resolved. For me, the task was then to visually articulate this balance of ambiguity and clarity in the narrative drawing, first creating a level of affective unclarity in the reader that I then develop and finally resolve. As with visual jokes, creating the right affective balance between ambiguity and clarity is the main task. Too much ambiguity and the reader doesn’t know what’s happening. To much clarity and the reader has no emotional stake in the story. In both of these scenarios, the joke (or in this case, affect) disappears and the story fails. I hope that I’ve managed to get the balance right! If so, each story should function as a parable, packing a lot of emotional punch (and taking the reader from ambiguity to clarity) with very few means. 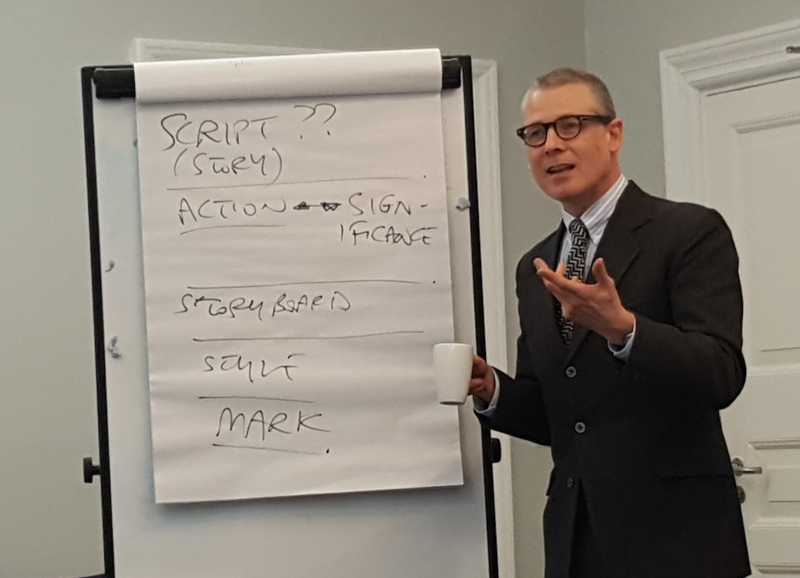 ‘A Theory of Narrative Drawing’: what theoretical principles did you apply in Parables of Care? That’s an interesting question. My new book A Theory of Narrative Drawing seeks to explain experiences of drawn stories, but it’s not quite a handbook for drawing stories! However, one of the interesting things about Parables of Care is its self-announcing, overt reliance upon the reader to articulate the visual story and the story world. Of course, the reader always undertakes this articulation, in every story. However, in Parables of Care, this is entirely due to the creation of ambiguity in each story. These are stories where a reader feels that they can or are making mistaken readings or, if the stories don’t clarify themselves for some readers, they think that the stories are simply incoherent or/and badly told. It is only when a reader realises that ‘making mistakes’ is an affective substitute for aspects of the experiences of dementia that are told about in each story, for example, that the sensation of ambiguity is transformed, located and resolved. This is entirely the type of affective reading that A Theory of Narrative Drawing explains. What are you hoping Parables of Care can achieve? SG: I hope that Parables of Care will focus attention on the emotional aspects of dementia care. We have worked hard to introduce readers to the (largely non-clinical) experience of dementia care by providing them with affective sensations of ambiguity, including a sense of inexplicable altered capacity, frustration and maybe a sense of powerlessness. These sensations are turned around and articulated in each story, retaining the emotional intelligence and creativity of the resolutions to challenging situations. The reader goes throught this process too, and reaches a similar clarity and resolve. Posted: 10.12.2017 . Posted in: Interviews, Parables of Care, Project Updates. Tagged: comics, dementia, drawing, HCID, manga, mental health, Parables of Care, Simon Grennan, social care, yonkoma. Bookmark the permalink.